A Second Look At The First Photo Of A Human : Krulwich Wonders... See an 1838 photograph of what might be the first human caught on film, now in color! 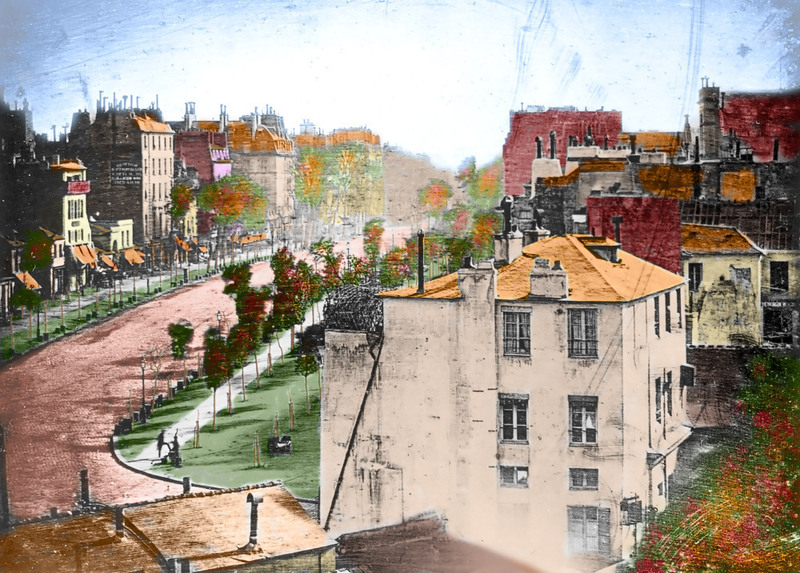 A reader colorized Louis Daguerre's Boulevard du Temple, then scrutinized all the minute details in the image. This keeps getting more and more interesting. Here's a photo I blogged about last week. 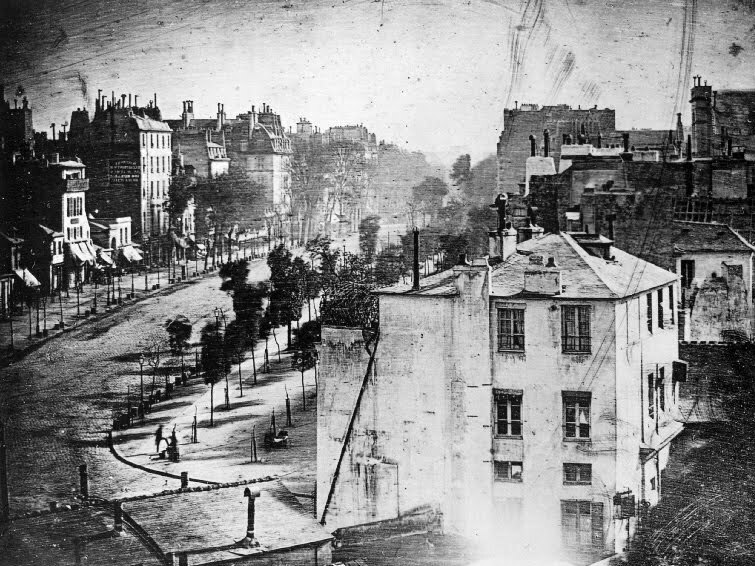 It shows a street in Paris, back in 1838. This picture, I said, may contain the first ever photographic image of a human being. He’s on the lower left, maybe getting his shoes shined. Here is the same photograph again, courtesy of a reader who calls himself Charles Leo (Toxic), this time in color! 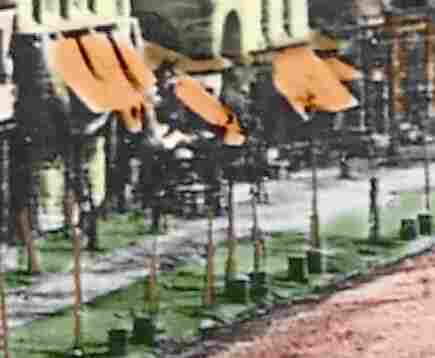 What I ended up with was a colorized version of this Daguerreotype. I didn't spend too much time refining the image – maybe a little over an hour tops. I could spend days if I really wanted to get it just perfect, but for the purpose this suited it just fine. His purpose, he says, was to see what else is going on the photo. And he thinks maybe there are more people in the picture. A lot of you wrote in to say the same thing but let's take a look at his version, with annotations. He's got three candidates on the street: two possible adults (I can’t see them, maybe you can?) and perhaps one child. The child seems a little more plausible. In this closer-still version, I can make out a boy-looking figure with a white cap leaning against something (a tree?) with a dog just behind him. Can you see what I see? If you want to look still closer, go to Mr. Leo's blog Lunarlog. He’s got a more detailed photo. And finally, another reader, Shannon Marcum, also known as "sweetshannon111" wrote: "Is it just me, or does anyone else notice the little face in the top window with the curtain pulled aside in the building on the right?" It may be just her. I looked and I can’t see what she sees, but I don’t know -- take a look for yourselves.